Turning Your Dreams Into Reality! Tanzania is a country of incredible beauty and biodiversity known for its vast wilderness areas and famous National Parks. They include the plains of Serengeti National Park, a safari mecca populated by “Big Five” game and home of the greatest wildlife show on earth, the wildebeest migration. Tanzania undoubtedly offers the most diverse attractions on the continent with highest peak, snow-capped Mt. Kilimanjaro, Ngorongoro Crater and offshore islands ringed by golden sands and marine parks with superb diving and water sports. With 38% of it’s land area set aside for protection, no matter your interest or budget, it has something for everyone. Arusha is the safari capital of Tanzania – nestled below Mt. Meru and close to Mount Kilimanjaro. From Arusha you head to Lake Manyara, Tarangire and Ngorongoro National Parks and from there it’s a short trip to the Serengeti. Just to the north, on the slopes of Mt. Meru is the Arusha National Park. This exceptionally beautiful area is divided into three parts Mt. Meru, the Ngurdoto Crater and the Momela Lakes which means it has a wide range of habitats. Arusha National Park is not known for its big game viewing but offers a wide range of smaller animals, plenty of birds and breathtaking highland Afromontane forests.. Arusha was built by the Germans as a centre of colonial administration because of the temperate climate. Serengeti is the best known wildlife sanctuary in the world and is synonymous with an African Safari. The name “Serengeti” comes from the Masaai language and means “extended place”, a name very appropriate for the endless plains of the southern Serengeti. More than 3 million game animals roam these plains and rolling hills interspersed with kopjies or rock outcroppings. It is the place of the largest wildlife show on earth – the migration of 2 million wildebeest, a quarter million zebra and half million Thomson’s gazelles in search for green pastures. These grazing animals are followed by carnivors in large numbers, such as huge price of lions, leopards and cheetah, giving you excellent wildlife observation opportunities. The Serengeti can be divided into three regions: the southern grass plains, the western corridor and the northern Serengeti with each area having very distinct habitats. The southern grass plains have endless, almost treeless, wide-open plains; the western corridor has rock kopjes and the Grumeti River, and the northern Serengeti is largely open woodland and rolling hills. As well as the herds that make up the migration followed bymany of the cats, there are also plenty elephants, buffalo, impala, giraffe and many other species of plains game. In the northern Serengeti, there is a growing population of rhino. The Serengeti is not fenced and surrounded by a number of huge reserves and private concessions. Together with the National Park these make the greater Serengeti eco-system. They act as a buffer for the National Park and most are in the path of the annual migration, which make them critical to the region. Loloindo Game controlled area borders the Serengeti on the eastern side and is known for its unspoilt Masaai culture and the ability to conduct night drives and walks. The wildebeest migration is the biggest animal spectacle on earth. Yet even without the migration, the scenery oozes Africa and anyone having watched “Out of Africa” and longed to experience it will have a most marvellous time. Possibility is year round with heaviest rains late March to late May. Busiest tourist time is during July and August, and it can get very busy with many vehicles at wild life sighting. The advent of the shor rains	means that	the Southern Plains are green now, so huge herds of migrant wildebeest, zebra and gazelles can usually be found. Game viewing is usually excellent in the Ndutu area, with good cheetah	sightings. Predators are targeting the young gazelles being born. In some other parts of the park, the availability of plenty of fresh green grass and water means that the game is well dispersed. elephant and buffalo are generally easy to locate. In drier years, the great herds pull	back into	the woodland to the west in search of grass and water. In some years, a pack of Wild Dog might roam the far south. plain. In other parts of the ecosystem,	access	can become difficult due to muddy conditions. explosive action when the herds come down to drink. can make game viewing difficult. The south is dry and dusty. wildebeest following later in the month. the migration has moved on. down and overall game viewing is excellent. storm. Grass is still short in the center, north and west of the park and the viewing remains good. Each year, the migration moves through an approximate corridor dictated by rainfall and the availability of nutritious grass. Yet weather patterns have been irregular in the last couple years and so are the patterns of the migration. Hence, this guide is an approximation only. Often the herd also splits into many smaller herds which can be found in different areas. The Southern Plains of the Serengeti are where it all begins. Here is where the wildebeest are calving, each year in late February or March and life begins for half a million. As the southern plains dry out and the rut begins with the herds beginning to move. April and May find them flooding through Moru Kopjes in the South Central Serengeti as they begin the journey north. As the migration gathers momentum, the herds enter the Serengeti Western Corridor. It’s here that the wildebeest and their newborn calves meet their first serious barrier in the form of the Grumeti River and its many crocodiles. 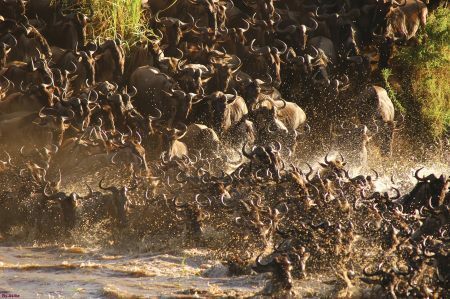 Between August and November, the migration reaches its northern range: the grasslands on either bank of the crocodile-infested Mara River which the herds must cross not once, but twice, as they complete their migration. Please note that unpredictable weather patterns have a dramatic effect on migration movements and while we use our extensive experience of operating in the Serengeti, we can never absolutely guarantee that clients will see the migration. Tarangire National Park is known for having the greatest concentration of wildlife outside of the Serengeti eco-system. Named after the river that crosses through it, this park at 1,100 square miles located south-west of Arusha, is sometimes sadly missed by those heading for the more well known of the National Parks in Tanzania. Yet we can highly recommend it for its elephant migration, quiet authentic atmosphere and fantastic birding opportunities. 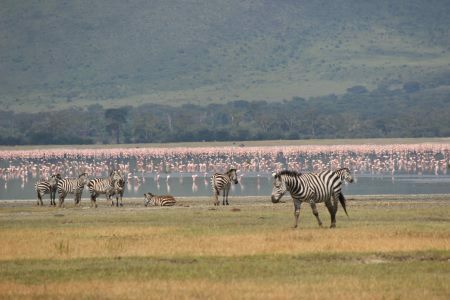 During the dry season, the river is the only source of water for many animals, with thousands migrating to it from the nearby Lake Manyara National Park. The landscape here is diverse, with a mix of habitats that are unique to the area and not found anywhere else: hilly landscapes are dotted with vast numbers of baobab trees, dense bush and high grasses. Herds of up to 300 elephants congregate here, whilst migratory wildebeest, zebra, buffalo, impala and eland can also be seen, with the accompanying predators following along behind. On drier ground you find the Kori bustard, the heaviest flying bird; ostriches, the world’s largest bird; and small parties of ground hornbills blustering like turkeys. The park is also famous for the termite mounds that dot the landscape. Those that have been abandoned are often seen to be home to dwarf mongoose. The swamps, an oasis of green year round, are where you will find over 550 bird species, the most breeding species in one habitat anywhere in the world. It is a birder’s dream with frequent sightings of yellow-collared lovebirds, which can be seen during a game drive alongside the river. 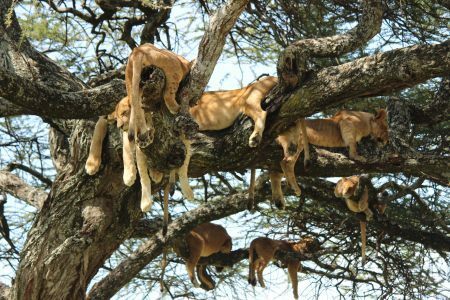 Tarangire’s pythons climb trees, as do its lions and leopards, lounging in the branches where the fruit of the sausage tree disguises the twitch of a tail. Tarangire offers the opportunity to walk and do night drives in addition to regular game drives. The park, slightly off the main safari route and hence less busy is easily combined with the Serengeti and Ngorongoro Crater. We highly recommend Tarangire if you prefer a quieter safari than can be had at any of its famous neighbours, the different habitat and excellent value. JANUARY - MARCH 75-135mm/28 ̊C (82.4 ̊F) January through March is when the park tents to dry out a little after the early rains of late November and December. The park is green and full of life as the trees flower and the wild flowers start to bloom. The migrant animals (mainly zebra and wildebeest) move out of the park to their green season grazing but the larger herbivores and predators remain. Because of the standing water, dry season movements between highland grazing and the river change and the animals are dispersed and can be more difficult to see due to the high grass. This is the best time to see avian migrants in all their amazing breeding plumage. APRIL 185mm/27 ̊C (80.6 ̊F) April & May are when the majority of the rains fall and the weather tends to be overcast, the roads muddy and the mosquitos prolific so most camps are closed now. MAY 65mm/25 ̊C (77 ̊F ) April & May are when the majority of the rains fall and the weather tends to be overcast, the roads muddy and the mosquitos prolific so most camps are closed now. JUNE 5mm/24 ̊C (75.2 ̊F) The long rains have just finished and the grass is still long which can make game viewing a little more challenging. Many of the migrant animals are still out of the park to the east. There’s	still	a	lot	of standing	water	around, Silale	is	green	and scattered with pools. This is a great time for water birds and also for large herds of buffalo, which benefit from the	absence	of	other herbivores. Walking can be difficult at this time. The park is often still quiet and the scenery beautiful and clear. JULY 1mm/23 ̊C (73.4 ̊F) The park is starting to dry out and the herds of zebra and wildebeest start to accumulate east of Silale around Lemiyon and Serengeti Ndogo. The habitual daily	treks between the ridges for grazing and the river for water begin again. The grass is slowly	being trampled	down, making both herbivores and predators more visible. AUGUST 1mm/25 ̊C (77 ̊F) August is dryer still and the daily commute of the wildlife between the higher ground and the river is becoming more pronounced. The movement further tramples the grass, and makes the game viewing easier. Birds concentrate at the diminishing pools, particularly pelicans and marabou storks which prey on the increasingly isolated fish. This is a great month to get out on foot. 15mm/28 ̊C (82.4F) September and October tend to be the hottest, driest months. Food starts to become more hard to come by and the water is diminishing. Elephants dig wells in the sandy river beds, in turn visited by other animals. This is particularly good time for night drives when predators are actively targeting the animals that are beginning to weaken from lack of food. The concentration of birds is increasing and during October, the first northern migratory birds arrive. NOVEMBER 80mm/29 ̊C (84.2 F) November is a mixed month – it can be hot and dry or wet depending on when the rains start. Either way it is a good time to visit. If it’s dry, the game viewing is much like September and October, but it if it’s wet, there’s a wonderful spring like feel to the place. The grass and leaves quickly sprout green shoots and the animals all have extra bounce after a lean period. With the fresh grass, the animals don’t need to drink as much so the behavior changes once more. The birds start to exhibit territorial behaviour. DECEMBER 112mm/29 ̊C (84.2 ̊F) We expect a bit more rain during December and the temperature is warm and muggy. The birds are now in full breeding plumage and are frantically nest building. The migrant herbivores start to move out to their green season grazing territory to the east but this is a wonderful time to see elephants wallowing, fowers and greenery. The grass is still short enough to see wildlife though. The jewel in Ngorongoro’s crown is a deep, volcanic crater, the largest un-flooded and unbroken caldera in the world. About 12 miles across, 650 yards deep and 180 square miles in area, the Ngorongoro Crater is a breathtaking natural wonder and a must see during a visit in Northern Tanzania. Yet it’s beauty and density of big game make it a highly coveted and much crowded destination. Game easily spotted include elephant, lion, black rhino, leopard, hyena, wildebeest, herds of buffalo, zebra, gazelles and flamingo . The forested crater rim of the Ngorongoro crater is in stark contrast with the crater floor, which consists mostly of grassland. Another feature on the crater floor is Lerai forest, a beautiful atmospheric yellow fever tree forest. The highlands rolling around the crater of Ngorongoro are part of the Ngorongoro Conservation Area (NCA) measuring 5,100 square miles and the only place on earth where mankind and wild animals co-exist in harmony. Traditional Masaai villages and life still remain intact to this day. The NCA became a Man and Biosphere Reserve in 1971 and was declared a World Heritage Site by UNESCO in 1979. Situated between the Highlands and the Serengeti is “Oldulvai Gorge” also called the Cradle of Mankind due to its numerous important archaeological finds. Made famous by Louis and Mary Leaky, discoveries date back to almost 2 million years ago. It is also the site of a small museum and guides are available to walk around the gorge. Trekking in Maasai land, adjacent to the National Parks, affords unique opportunities get out and discover the bush on foot, encountering animals and learning about the African wilderness in way that is impossible from inside a vehicle. There are some magical walks and treks around the Rift Valley escarpment which come in the form of palm fringed waterfalls, flamingo-pink shores of alkaline lakes, and rocky hilltop lookouts over the bush. Geological wonders are found at every turn, and of course there’s always a great chance to view wildlife, especially birds and smaller creatures which are often missed from inside a safari vehicle. Your Maasai trekking guides are with you every step of the way, introducing you to the magnificent wilderness that is their home and their way of life. Combination of excellent opportunity to see the “Big 5” in one of the most scenic settings in the world. It is the experience of a life time. Very few places have the density and variety of game on that level. Ease of being able to see black rhino, a very endangered species, and generally difficult to see elsewhere. Visit traditional Masaai bomas in the Highlands or trek through the highlands with your Masaai guide. Unless you choose to fly into the Serengeti, Ngorogoro is on the way and a must see. In the crater see elephants with the largest tusks left in Africa, large prides of lion, lots of hyena seen during daytime. Large flocks of flamingos during high water levels of Lake Magadi. High density of game which does not move out of the caldera makes it an ideal year round choice. Low season will have less vehicles and afford a better experience. Busiest times are July, August and Christmas. No matter when you go, the game viewing will be superb. Due to the size of the crater we only recommend spending one day of game viewing in the crater itself. The Highlands lend themselves to activities such as horse back riding, hiking through coffee plantations, and mountain biking. 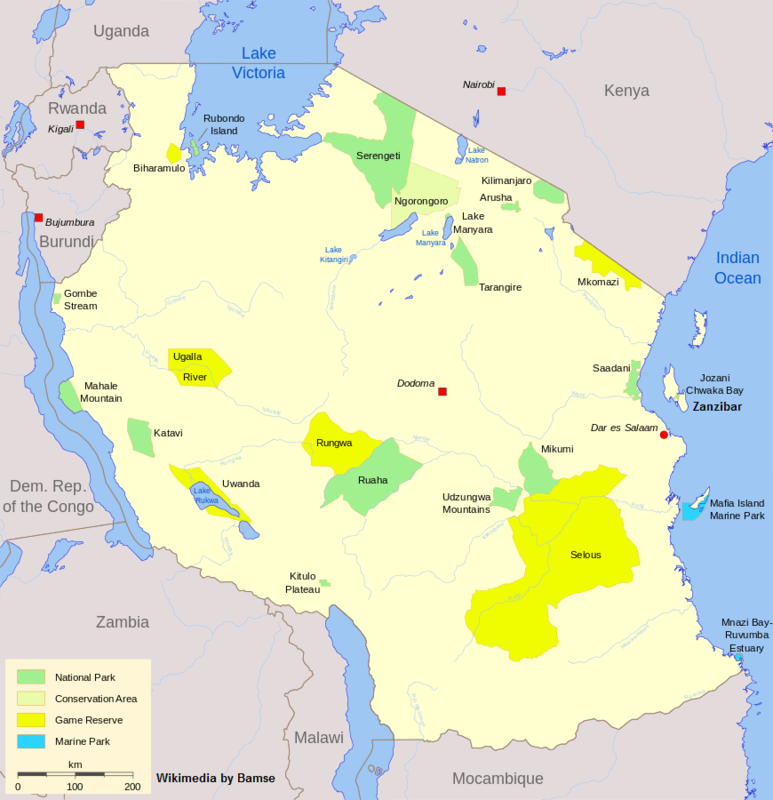 Africa’s largest wildlife area, bigger than the size of Switzerland is located in southern Tanzania and also a UNESCO World Heritage Site. Uninhabited by man, roaming with elephants and offering safaris in absolute wild and unspolied bush.One of its many highlights is the Rufiji River, the lifeblood of the reserve, which flows through the northern part of the Selous into the Indian Ocean. It was named after Englishman Sir Frederick Selous, a famous big game hunter and early conservationist, who died at Beho Beho in this territory in 1917 while fighting against the Germans during World War I. His adventure books on Africa became best sellers in Victorian England. The Selous has a vast variety of habitats from riverine forest, sand river channels, miombo woodlands, wide-open savannahs, and doum palm forests. The reserve is home to all the larger mammal species: lion, leopard, elephant, buffalo and even the very illusive black rhino as well as one third of wild dogs in the world, as well as an array of river and bird life. Along the Rufiji, you can often see antelope, crocodiles and hippos and during the dry season the concentration of animals along the river increases hugely. Because the Selous has so many different habitats, there is a wide choice of safari activities that can be done, from boating, fishing (for tigerfish and catfish), walking, game drives, and fly camping. This is a wonderful place to immerse yourself in the African bush at an easy pace, without the crowds found in the northern parks. Huge wilderness with authentic, untouched, crowd free safari experience. Excellent chance to observe rare and endangered wild dogs. Ability to partake in walking safaris, fly camping under the stars and boating on rivers and lakes. July to October is the best concentration of game with late dry season best along the rivers and lakes. Elephants come to the water and carnivors are seen more frequently. January and February is spectacular for birding. January 200mm/32 ̊C (89.6 ̊F) Typically the Selous is fairly green after December rains. Wildlife may be dispersed from permanent water sources, although in dryer years mammals continue to stay near the lakes and river. Rainfall is erratic. All migratory species of birds have arrived and many begin to display breeding plumage. Fishing is mediocre and heat and humidity are both high. Because January is typically a very hot month, early morning or evening walks are best, especially in the well-shaded miombo areas. Fly camps may be disrupted by rain. February 200mm/ 32 ̊(89.6 ̊F) February may have significant rainfall or very little depending on the year. The Selous may be very green or remain fairly dry. Wildlife is unpredictable because a lot depends on the rain. Wildlife often utilizes woodland habitats and are less frequently seen around the river. February is typically one of the most beautiful months in the Selous. Visibility may be reduced and roads may be poor if there is heavy rainfall. See January for walking and fly camp conditions. March 250mm/ 32 ̊(89.6 ̊F) Similar to February but with greater rainfall. Roads tend to be in poor condition during stretches of rainfall, especially towards the end of the month. Vegetation growth also means that visibility is reduced, but the Selous is at its most beautiful when everything is verdant green. The river typically rises during March and sandbanks become submerged. Fishing is usually poor because the river carries more sediment and wildlife is less likely to congregate along the river, but boat safaris are always beautiful and a nice change of pace from game drives. Walking is excellent at this time of year, especially in the cooler woodland areas. May 75mm/29 ̊C (84.2 ̊F) Camps reopen at the end of May. Signs of the approaching dry season may become apparent, although the rains sometimes last into early June. Wildlife tends to be very dispersed and the river is typically high. Hippos often disperse into side channels. The sand river may be inundated with water. Temperatures start to cool off and weather is often overcast, but high humidity persists. June 25mm/29 ̊C (84.2 ̊F) Throughout June, signs of the approaching dry season are evident. The water recedes from the sand river, grasses dry out, and leaves begin to fall by the end of the month. Wildlife is in top condition. Fishing is usually superb once the water levels fall. Many birds still have their breeding plumage, although many migrants depart in early June. June is an exciting month because it reveals changes to lion prides during the rainy season. Often new litters of cubs are discovered. June is a common month for many plants to flower. June is typically cool, with some rainfall early in the month. Days are often overcast, which makes for great afternoon and late morning safaris. Good time for fly camping. July 0mm/28 ̊C (82.4 ̊F) July is when the dry season begins in earnest. Deciduous trees drop their leaves throughout the month. Wildlife leave the dried out miombo habitats and sightings become concentrated along the river and around the lakes. Fishing and walking are superb and sightings increase as the vegetation opens up and the understory dries up. In particular, the sand river and jungle game drive route comes into season. Fishing and river sightings are excellent. By the end of July, the river has dropped and sand banks are exposed for hippos and crocodiles to sun themselves on. July is typically the coolest month with overcast skies but 0mm of rainfall. It is common for guests to prefer long clothes for evenings and early mornings, especially on the river. Cool, overcast mornings allow for fantastic long walks. Excellent month for fly camps. August 0mm/29 ̊C (84.2 ̊F) The dry season is in full swing now. Marshes such as the garden are still well watered, however, so they become popular grazing and drinking spots for all the herbivores. This, in turn, draws predators to areas near camp. A number of trees such as figs fruit during August and these trees become popular forage sites for elephants and a host of other animals. Elephant sightings in camp occur regularly or even daily. Predator sightings are typically excellent as are wildlife sightings on the river. Fishing remains very good. The weather remains cool with typically overcast skies in the morning, but begins to warm up by the end of the month. Excellent month for fly camping. critical. The garden teems with game in the afternoon, and late morning sightings of wildlife coming to drink at the lakes and rivers become regular. September is an excellent month for predators and game loses condition and becomes vulnerable around drinking spots. Elephants continue to follow the river, and depend on the riverine vegetation as other food sources are depleted. Elephants also begin to dig drinking holes in the dry riverbeds. safaris are excellent, as are fly camps. October 25mm/31 ̊C (87.8 ̊F) October is very similar to September. By the end of the month, even some of the smaller lakes and the garden become dry. Elephant’s resort to stripping bark off the trees for sustenance and their impact on the ecosystem becomes very apparent. The first migratory birds begin to arrive. Fishing and fly camping are good. October often brings isolated storms and rain showers. Temperature and humidity increase considerably. green flush of the season. The grasses sprout 5-7 days after the first period of sustained rainfall. sources.. Fishing remains good. Fly camping depends on rain patterns. December 150/32 ̊C (89.6 ̊F) December is typically a month of change. Migratory birds become ubiquitous, trees begin to grow new leaves, and by the end of the month, the green season has set in. Wildlife movements depend heavily on rainfall patterns but by the end of the month, herbivores begin to utilize fresh grass in the woodland habitats. Wildlife sightings along the river decline and fishing is poorer as the river carries more sediment. December is a very hot and humid month. Fly camp may be disrupted by rainfall. 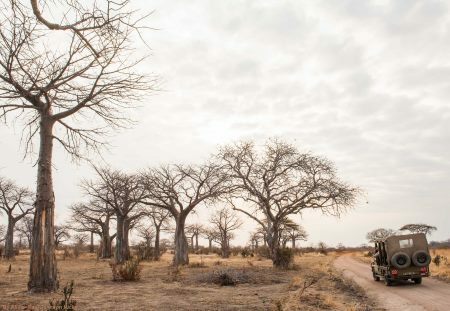 Ruaha offers varied dramatic scenery, which includes rolling hills; large open plains; groves of skeletal baobabs and along its southern border, the Great Ruaha River, from which the park gets its name. No other National Park in Tanzania has the diversity of Ruaha. Elephant in huge numbers are a common site and the population seems to be growing. Giraffe are everywhere, as are zebra and impala among the other herbivores. Both the greater and lesser kudu occur here, as do the magnificent eland, sable and roan antelope. The Ruaha River also provides an ecosystem on its own with its huge Nile crocodiles, pods of hippo and all the other smaller mammals and reptiles. Wet season sees a variety of waders appear along the riverbanks, together with flocks of white and Abdim’s storks. The sooty falcon arrives from the Sahara Desert, and the rare Eleonora’s falcon from the Mediterranean. Ruaha has an abundance of predators, and a particularly healthy lion population – it is not uncommon to see a pride with twenty or more. The rugged terrain of Ruaha is perfect for leopard and they are seen regularly. The African hunting dog also occurs in the Park although their huge ranges make them a little more difficult to find. The same is the case with cheetah. Hyena and jackals are common and their cries are often heard after dark. With only a handful of lodges located in the south and further inland from the coast, Ruaha has even less visitors than the Selous Game Reserve. Though it does not offer boating safaris, it offers affordable accommodation and a truly wild experience. Some of the best game viewing in Tanzania with very few tourists and at excellent value. Untouched feel and authentic safaris. Some camps offer walking safaris although night drives are not allowed. Some consider the park Tanzania’s best kept game viewing secret due to the untrodden trails and varied and prolific wildlife. Unusual antelope species such as roan, sable and greater kudu. Excellent birding. Best in the dry season (June to October) and even better towards the end of the dry season as animals concentrate around the water. Keen bird-watchers visit Ruaha National Park from mid-November to March, when migrant birds swell the numbers. January 200mm/32 ̊C (89.6 ̊F) From mid-January we see the start of the best season for birds, flowers and migratory birds – a spectacular display of vibrant colour which is a true pleasure to see after the dusty, dry months. The baobabs are covered in new leaves and flowers and the rivers are in spate. The elephant tend to move to higher ground during this time and disperse, however there is still a good chance of seeing many resident species, with the benefit of a magnificent backdrop! There’s the chance of heavy rain. February 200mm/ 32 ̊(89.6 ̊F) The rainy season continues into February and the wildlife experience is much like January. While the larger herds of elephant and buffalo disperse, sightings of cheetah go up during these months and there’s still plenty of resident game around. The park undergoes a metamorphosis during this time; trees bursting into flower and colourful birds in breeding plumage everywhere, plus migrants from both the south and Europe. Walking may be limited during these months due to high grass. It tends to be temperate with humid afternoons. See January & February. Roads may become more challenging later in the month and some camps close mid-March until June. April 250mm 30 ̊(86.0 ̊F) Heavy rainfall in April. Many roads become impassable. Some camps camps are closed during April. May 75mm/29 ̊C (84.2 ̊F) The end of the rains and the roads begin to dry up. Some camps remain closed through May. June 25mm/29 ̊C (84.2 ̊F) The rains have come to an end by now but the vegetation usually remains green and beautiful for a short while before leaves start to fall in July. As the bush starts to thin, we see the big herds beginning to form as the buffalo move south and the elephants come down from the highlands. In pursuit of the buffalo come the lion…this is the richest time of year for wildlife viewing. July 0mm/28 ̊C (82.4 ̊F) The dry season begins in in earnest now and the wildlife congregates along the river lines where the vegetation remains green. Herds of 400-500 buffalo and several hundred elephant are not uncommon, nor are sightings of leopard, lion and cheetah. The walking is easier as the grass dies back and the dry river beds often make suitable pathways through the bush. August 0mm/29 ̊C (84.2 ̊F) More fabulous game viewing and the weather remains cool in the mornings and evenings and warm during the day. The trees have now mostly shed their leaves. This is when the roan and sable venture down from the highlands so these next two months present the best opportunity to see these rare antelope. September 75mm/29 ̊C (84.2 ̊F) The weather starts to warm up now and the landscape has assumed its dry mantel. While the Ruaha River flows year round, it’s at its lowest in Sept/Oct and the hippo pods may be more concentrated now. This is still a great month for Ruaha’s speciality: elephant, plus herds of buffalo and growing prides of lion. October 25mm/29 ̊C (84.2 ̊F) This is the hottest month in Ruaha, but also possibly the most intense for wildlife. The diminishing water and green vegetation encourage game to congregate along the still- green river lines and the birding is also excellent. The rains return this month, normally early in the mornings, and it can be humid in the afternoons. The bush will not green up for a while so it’s still a great month to view wildlife and birds alike. December 0mm/29 ̊C (84.2 ̊F) The weather remains humid with rains in the mornings, but don’t let a few drops spoil your explorations. There is still plenty to see and so it’s worth getting out and about in search of big and small game alike. Walking is still possible as the grass is still short, despite the green flush that may be evident. In Mahale the chimpanzees are the star attraction. There are roughly 900 chimps in the park with 60 of them, the Mimikire Clan, habituated to people. They go where they want and when they want but are relaxed near people, so it’s possible to track and observe them from very close quarters. Reaching them can mean a leisurely 20 minute hike or strenuous two hour trek. Sitting and watching chimpanzees going about their business is one of the more touching and unusual life time experiences you will ever have. Please be aware that protection of the chimpanzees only allows you to be with them for one hour. 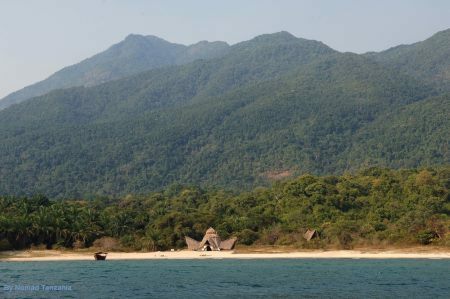 The park lies on the shores of Lake Tanganyika in Western Tanzania and is a chain of wild, jungle-draped peaks towering almost 1.2 miles above the shore of the azure waters of Lake Tanganyika. The lake is fringed by white sandy beaches. Perhaps the best guidebook to Tanzanian safaris describes Mahale Mountains National Park as “quite simply one of the most beautiful parks anywhere in Africa” .The only access is by boat and there are no roads in the park. You will be hiking to view the chimps. Kayaking and fishing are other activities available. Although chimps are the main attraction, there are also troops of colobus, red tailed and blue monkeys. Mahale also offers a diverse forest fauna and its extreme remote location make this destination unique and exceptional. Japanese primate researchers began exploring along the shore of Lake Tanganyika, south of Kigoma as early as 1961. In 1965, the researchers established their first camp, ‘Kansyana’, in Mahale and began habituating chimpanzees. It is one of only two (the other is Gombe) protected areas for chimpanzees in the country. Best overall chimpanzee viewing in Africa. Observing a troop of chimps is simply touching and magical. Bewildering beautiful park on Lake Tanganika. Towards the end of the dry season (August to October) Mahale’s chimp treks are at their easiest, as the forest paths are at their driest and least slippery, and the chimps are usually at their closest to the shore. Although, with patience, you can find them all year long. Chimpanzees are wild animals and sightings can not be guaranteed although you would have to be very unlucky not to find them looking for them a couple of days. January 240mm/27 C (80.6 F) Large groups of chimps begin to disperse into smaller clusters of tighter family members and close comrades as the community spreads out to ensure ample food for all. An interesting time for chimp researchers and animal lovers who enjoy seeing the dynamics of chimpanzee politics, because dispersal shows the strength of relationships and is a key time during power struggles as food resources are vied for. February 220mm/27 ̊C (80.6 ̊F) A lovely time. As in January, small clusters of close-knit chimps forage and patrol their favourite areas, including the beach/forest edge where the camp is located. Rains continue to shower the forest occasionally, and with luck, a storm far out over Lake Tanganyika is a spectacle not to be missed…get the tripod, open the shutter and wait for lightening. March 380mm/27 ̊C (80.6 ̊F) Soon the camp will close, as fewer visitors arrive, some guests may find they have the camp to themselves. Redtailed monkeys and trumpeter hornbills watch over the camp from the forest edge. The chimpanzees are moving higher up the slopes to take advantage of more fruit in the upper slopes of the forest. They tend to come together in larger groups more often. There can be heavy rain. April 290mm/27 ̊C (80.6̊F) Camps are closed for annual refurbishment and rainy season. May 200mm/28 ̊C (82.4 ̊F) Greystoke re-opens near the end of this month. The forest is dense and Tarzanesque, the perfect picture of rainforest habitat. Guests should expect to walk deep into the forests and up the slopes of the Mahale Mountains to join the chimps as they feast on ripe fruits. As May comes to an end, so do the rains, and Greystoke opens its “doors” to our adventurous guests. June 70mm/28 ̊C (82.4 ̊F) Dry season begins, warm days invite afternoon swims in	Lake	Tanganyika. Morning,	however,	is devoted to finding chimps. Chimpanzees can often be found in big groups but can be quite high in the forest taking advantage of an abundance of fruit in the upper slopes. There can be sporadic rain showers, but it’s generally dry under foot. July 0mm/29 ̊C (84.2 ̊F) It just doesn’t rain, touch wood, but similar to June, chimps are still enjoying the fruit-rich slopes and can be found congregating in large groups. Mornings spent exploring this magnificent	forest, following the hooting calls of chimps are rewarding. Following a fresh lunch spread back at the lodge, afternoons of yoga, swimming, kayaking, and napping prepare guests for an evening boat cruise or…another foray into the forest to enjoy Mahale’s myriad other creatures. August 10mm/29 ̊C (84.2 ̊F) Still dry. Still very warm, the lake is constantly appreciated for its cooling swims and breezes, while chimp tracking is beginning to take up less of the day. Chimps follow the fruiting patterns, and the lower slopes are beginning to produce ripe fruit. Chimps can be heard hooting and screeching in the forest behind the camp. September 40mm/29 ̊C (84.2 ̊F) As in August, chimps are not high in the mountains anymore, reducing the tracking time. The dry forest provides lovely but challenging photographic light, interspersing light and shady patches. Afternoons are hot, but the lake is the remedy. Head out to the deeper sections with a towel, a cool box of drinks, a fishing line and a guide. Dive off the boat into the second deepest lake on earth, then cruise back to camp with a drink in hand and prepare to sample your freshly caught fish…sashimi at the sunset bar. October 170mm/29 ̊C (84.2 ̊F) Fluffy clouds roll in and the odd shower is to be expected, but the beach and the forest remain very warm and the sun always manages to make and appearance. Chimps are still low, often in the vicinity of camp. The beach life remains ideal, while the immediate proximity to the forest maintains the Robinson Crusoe feel that gives Greystoke its alluring charm. Not restricted to October, but worth mentioning, the odd leopard track is seen crossing the beach, as are warthogs, bushbucks and yellow baboons, to name a few. November 330mm/27 ̊C (80.6 ̊F) The chimps are still on the lower slopes, which is always good news. The rain forest begins once again to live up to its name this month, but your guides and trackers have ponchos for you, which are large enough to cover small packs and camera bags, keeping you and your equipment dry. As usual in the tropics, while rainy days do occur, the sun rarely fails to show its face for much of the day. With scattered clouds on the horizon, sunsets (and sunrises for the early birds) are more vivid than ever, setting the perfect scene for a private beach dinner, complete with flickering tiki lamps. December 222mm/28 ̊C (82.4 ̊F) Holiday season on the beach, mere steps from the forest, is a welcome respite from the cold for most visitors to Africa. Chimp tracking is similar to previous months, though never easy, not too much climbing is expected. Despite the extreme remoteness so sought after by our guests, you’ll be surprised to find a good number of the requisite Christmas delights on the table. Chimpanzees in the morning (in the camera lens, not on the plate), and Turkey on the table in the evening. Remote and off the beaten track are the hallmarks of Katavi. You will finds herds of buffalos in the thousands, huge hippo pods and croc galore in this wild part of the country. Bird watching during the green season is phenomenal. Unfortunately, the expense of reaching it in the west of the country make it a destination for the connoisseur of safari goers but it can easily be combined with Mahale National Park. Pure wilderness off the beaten track. High volume of game concentrated near water in dry season. Excellent combination with Mahale Game Park. Large buffalo herds and big lions prides. Huge hippo and croc populations. Never gets crowded. Katavi is superb in the driest months of the year (May-October and December-February), but unpredictable (and partially impassable) during the remainder. Best from July to October. Bird watching is at its prime from November to March with migratory birds being present but it can be hot and humid with many insects. February 188mm/28 ̊C (82.4 ̊F) Grasses and other vegetation have become problematic for game viewing; continued rains mean some tracks are impassible. The park, however, remains open to tourism for those who want to stay in National Park bandas, a local village 1 star lodge, or have camping gear. Birding is excellent as always. Camps are mostly closed, but the park remains open to the intrepid, waterproof tourist. drastically in a dryer than normal year. Grass is at its longest, concealing even elephants on the plains. Again, the only accommodations are as listed for February. May 21mm/28 ̊C (82.4 ̊F) Dry conditions set in quickly, with classic dusty roads and dry air, cloudless skies, yet floodplains remain lush and green. Tanzania National Parks begins its fire management plan, burning large designated areas of savannah to knock down grasses that have grown 3 metres tall. Some areas are blackened and some early visitors find this view disturbing, but the underlying moisture allows fresh growth and encourages wildlife onto the burned areas, increasing game viewing quality. Though daytime temps are warm/hot, nighttime and early mornings require a fleece or the blankets we provide in game drive cars. Cloudless skies mean crisp, cool mornings. June 0mm/29 ̊C (84.2 ̊F) Conditions similar to May, but continuing to dry. The river still flows but water levels fall so that by the end of June, the river may be crossable by 4x4 vehicle. Herds of elephant, buffalo, topi, zebra, giraffe, impala are common. Roan antelope can be spotted occasionally. Lions are a common sight, preying mainly on buffalo during the next few months when floodplains still support sufficient grasses to sustain herds of up to 2,000 buffalo. Hippos and crocs still have water, but some are seen to be moving into more permanent, known springs and mud holes in preparation for the coming drought. As in May, warm clothing advised for evening and early morning. July 0mm/29 ̊C (84.2 ̊F) a drop of rain is exciting. The river is drying rapidly, hippos are forced to crowd together into smaller and smaller waterholes or sections of river. Driving across the river makes game drives much more varietal and guides can cross at many points when they see action on the opposite banks. Lions still target buffalo and plains game mainly. 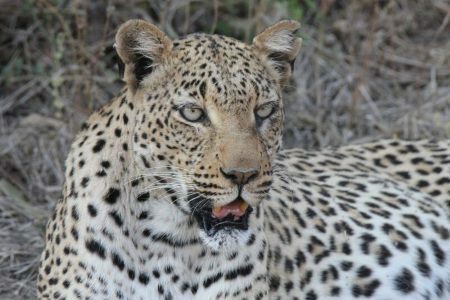 Leopards, as always, are elusive, but the miombo woodland sections of Katavi and the large impala population support plenty of these cats as well. Game viewing is excellent now, with less vegetation and mostly short grasses. August 0mm/28 ̊C (82.4 ̊F) The dry season is in full swing now. The river may dry completely, or at least stop flowing, leaving only scattered pools along its length which are dominated by hippos packed in by the hundreds. Having so many dominant males in such close proximity causes battles, which often result in death or grave injury, and the lions, hyenas and crocodiles are there to take advantage. This month or September sees the lions changing tactics from buffalo hunting to hippo scavenging. Elephants start to dig wells in the dry areas of the riverbed, since hippo dung has contaminated most remaining pools. Water for crocodiles becomes scarcer. 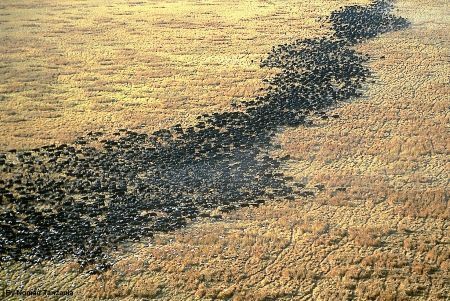 Huge herds of buffalo form black lines across the plains. Warm fleece for early a.m. may be needed. September 2mm/31 ̊C (87.8 ̊F) So dry now, even camps are asking guests to beware of shower water use. Monkeys and elephants try to reach into Chada’s outdoor showers for a drink. Crocodiles dig caves to escape the sun. Hippos try to survive by coating themselves with mud if available. Elephants and plains game visit two fresh water springs more regularly. Predators also frequent the springs to drink and hunt. Some species, including eland, are adapted to life without much water. It is likely to see lions eating hippos now. While five camps are operating now, Katavi remains very quiet compared to northern parks. Game viewing is excellent. Migratory birds begin passing through, moving south. October 24mm/31 ̊C (87.8 ̊F) Almost identical to September, possibly even drier, this is a very hot month, with a completely dry riverbed, and amazing wildlife sightings. Buffalo herds that began to disperse in September are now mostly broken up into smaller groups and many have migrated to the southeastern remote areas of Katavi where the ankle deep Chorangwa river still trickles, since buffalo must drink almost daily. There is a chance of a rain shower occasionally, but dry conditions persist as every droplet is immediately absorbed. Elephants can be seen napping in the afternoon, lying flat on their sides at Chada camp, conserving energy. Their commute between food and water is becoming very long now. November 128mm/29 ̊C (84.2 ̊F) By normal standards, Katavi is still wonderful for game viewing, though compared to the condensed concentration of game of the dry season, it pales slightly. Rains begin to fall and plains turn from yellow and brown to green. Grass is still short and game is easily spotted. Though elephants’ and lions’ habits become less predictable with the increase in water sources, an experienced guide is rarely snookered by this. Buffalo may begin to be seen in larger numbers again on the Chada and Katisunga plains as grasses grow taller toward the end of the month. Migratory birds may still be present this month. On rainy days, a fleece/jumper is desirable. December 222mm/28 ̊C (82.4 ̊F) Rains are likely almost daily, especially in afternoons, but sunny mornings and evenings are still common. Grasses grow longer while leaves return to the trees and shrubs to fill in the woodlands. This month is a safari veteran’s paradise for landscapes and lush habitat. Not ideal for the newcomer who needs to see a lion under every bush. Katavi is extremely quiet now, often having between 2 and 10 visitors in the entire park, despite being 3rd largest in Tanzania, second only to Ruaha N.P. and the mighty Serengeti. It is possible to spend days without seeing another vehicle. It is a couple’s modern day Eden. On rainy days, warmer clothing is recommended. With the Lake on its east and the Manyara Escarpment to its west the Lake Manyara National Park offers breathtaking views and a large variety of habitats. Acacia woodlands, water forests, baobab strewn cliffs, algae-streaked hot springs, swamps and the lake itself. Manyara has the largest concentration of baboons anywhere in the world. It lends itself for a picnic stop on the way to Ngorongoro Crater. Zanzibar – The “Spice Island” is influenced by a fusion of multi cultures and steeped in history still evident today. Spice Island, Slave Island, Arab Island, Tropical Island – Zanzibar is or was all of the above. The enchanting winding streets and high townhouses of old Stone Town remain unchanged with their giant, ornate doors. An archipelago with pristine beaches, excellent diving and the cobble stone, narrow lanes of Stone Town lined with enchanting historic buildings blending Middle Eastern, Indian and African architecture. The northern tip of the island is popular with tourists and dotted with many resorts since swimming in the ocean is possible even at low tide here. There is no shortage of activities from snorkeling to diving, kite surfing, biking, dhow sailing and spice farm tours. There are too many accommodation options to mention and they comprise from ultra luxury to budget. 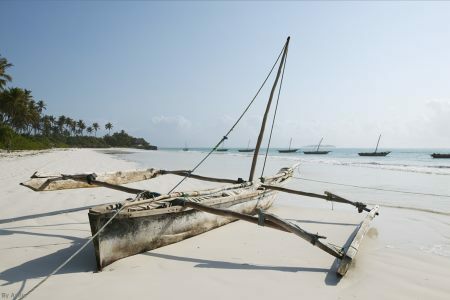 Combining an East Africa Safari with the golden beaches of Zanzibar is a dream made in heaven. Offshore islands holding private resorts provide secluded and intimate holidays for honeymooners seeking the ultimate getaway. Zanzibar is a jewel of an island in the Indian Ocean, ringed by fine, white sandy beaches and turquoise waters ideal for watersports. Get lost in the narrow streets of Stone Town that reveal historic Arabic influence. Visit the Zanzibar Museum, the Arab Fort, the Sultan’s Palace and marvel at the craftsmanship on many of the wooden doors. Take a spice tour where 80% of all cloves are grown. Scuba diving is spectacular with marvelous marine life and beautiful coral formations. If you are looking for cool and less humid weather consider visiting June through October. Christmas is a very busy time with hot and dry weather continuing until February. Rainy seasons, from mid-March to late May and again in November is not ideal for a visit at all. Best times to scuba dive off the coast of Zanzibar are in July and August and in February and March. Diving off the north coast is particularly good from June to October and off the south coast between November and March.